Just over a week ago, I spent a lovely day in Brighton with my friend Sophia. 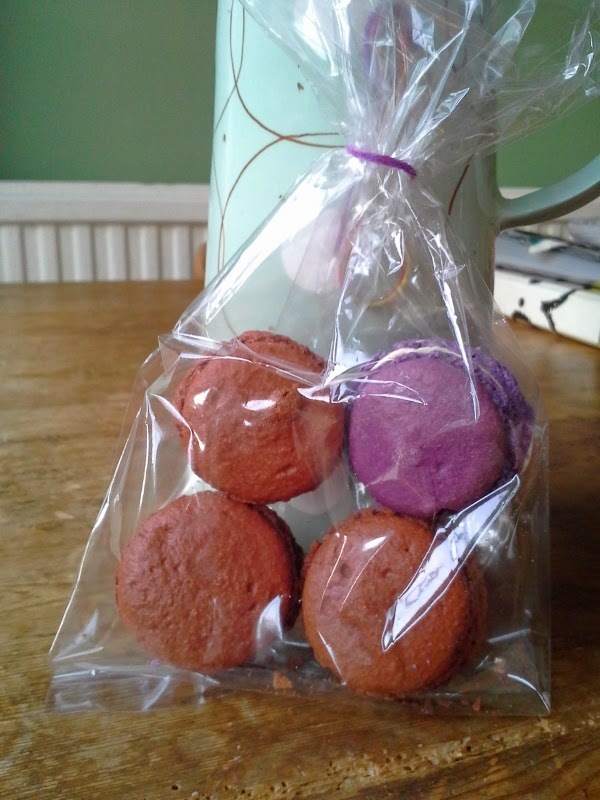 As well as a good excuse for a spot of shopping and a nice lunch at Vietnamese Restaurant 'Pho', our main reason for visiting was to attend a workshop at Angel Food Bakery on How to make French Macaron. Now Sophia is a bit of a dab hand at these already, but was keen to pick up any tips. I've tried them twice. Beginners luck gave me some passable Lemon Macaron. My second attempt........ well they were welded to the baking parchment. It seems these little blighters are a bit pesky and very sensitive. Preparation is key. 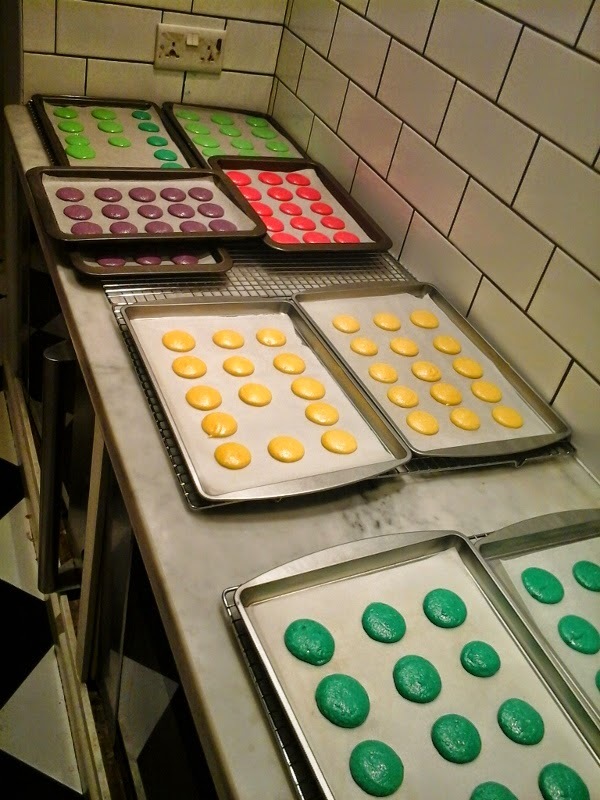 I have listed some of the top tips below to help towards a superior Macaron. We had a go at two types of Macaron. The first was a plain shell, which had colour added at the end of the meringue whisking. A simple butter cream was used as the filling and could have flavourings added. 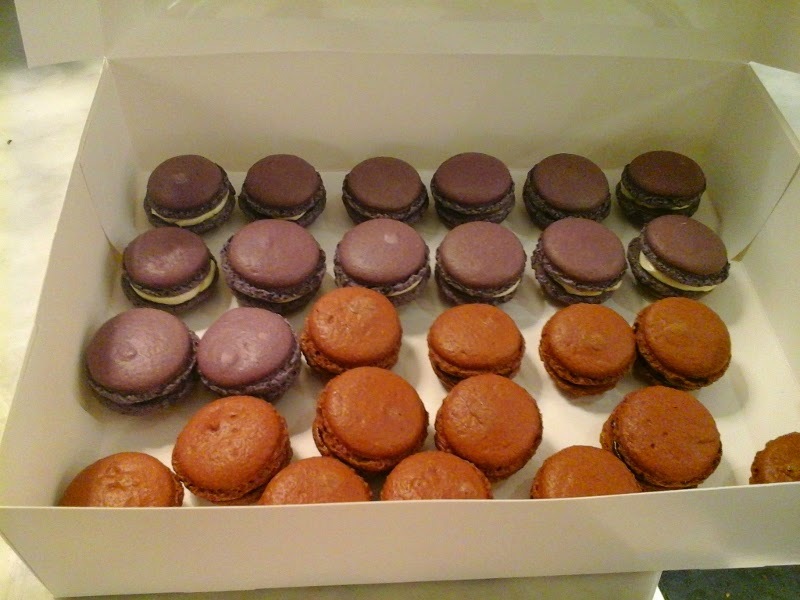 Not surprisingly, I chose to make purple Macaron. Sophia got a bit enthusiastic with the pink food colouring. There were 5 of us on the workshop and as you can see the colours are all pretty different! Once cooked and cooled, we then got to choose our flavour for the butter cream filling. 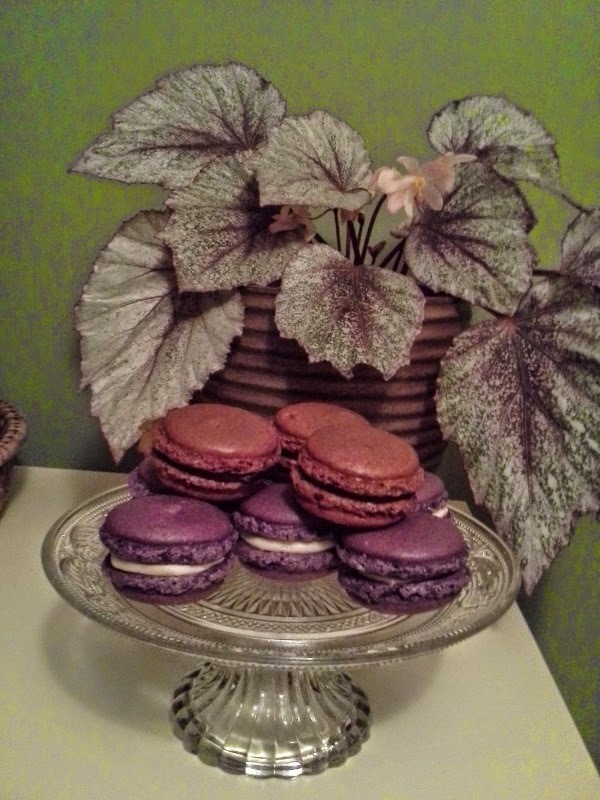 As mine were purple, I went for Violet and added just 5 drops of Violet flavouring to my butter cream. I didn't colour the butter cream as I wanted the contrast between purple and cream. They were lovely and delicate in flavour. We also had a go at Chocolate Macarons which has cocoa powder added to meringue mixture and were filled with a chocolate ganache. I opted to have half fill mine with dark chocolate ganache and then added some orange flavouring to the remaining ganache for a dark chocolate orange filling. Delicious. 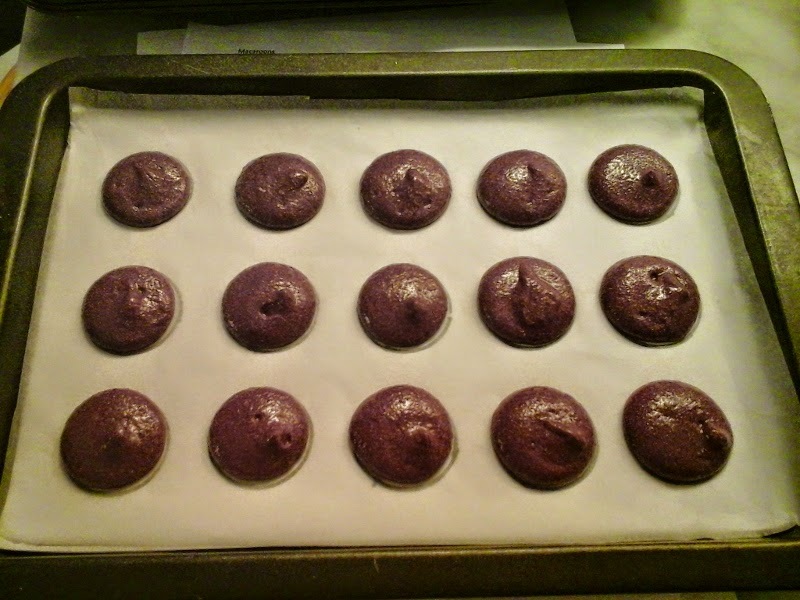 The chocolate Macaron are a little harder in texture, but still have an amazing flavour. They make a very decadent afternoon treat. Or equally lovely to give away as gifts. At £45 for a 3.5 hour workshop, its well worth the money and you come away with a box full of tasty treats. Top tips for a superior French Macaron. Crack your eggs at least a few hours before attempting Macaron. Ideally leave the egg whites to sit overnight. It helps loose some of their elasticity and makes a stiffer meringue. The ground almonds mustn't be too damp as you need to sift them first, but don't force any bits through your sieve, else you release too much oil and alter the crucial ingredient ratio. You may have to throw some large bits away, or save them for a cake that isn't so fussy! Sieve the already sieved ground almonds with your icing sugar and then grind together in a Magimix for about 10 seconds. 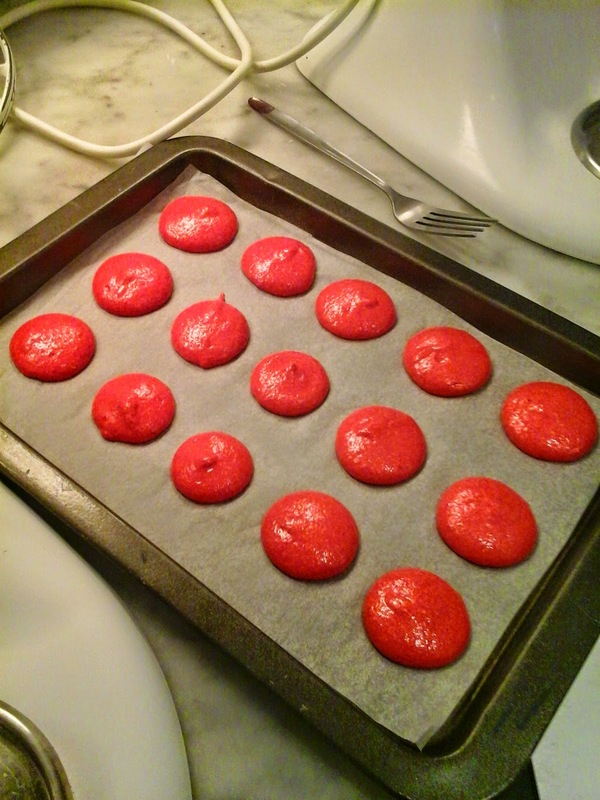 Food colouring powders are better for Macaron than liquid colouring as they don't affect the mixture ratio, but if you cant get them use colour pastes like Sugarflair. They give really intense colours. When you pipe the meringue onto your baking sheet, you are sometimes left with little peaks. To flatten out wet your index finger, shake off any excess water and gently tap the peak down. The proper whisking of the meringue is crucial. There is a fine line between under and over whisking. It needs to be whisked for at least 5-6 minutes until it resembles shaving foam and little bits start flicking off the whisk. This is when you add your colouring, then quickly turn off before it gets over whisked. 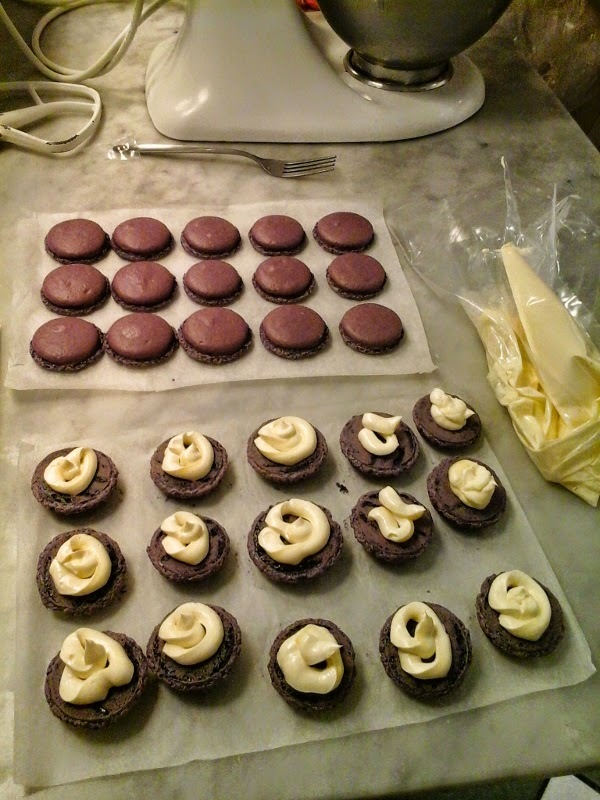 If you can bare it, leave the filled Macaron in the fridge, loosely covered, to mature for at least 24 hours. This helps the flavours meld into the shells and gives them their distinctive chewiness. Filled Macaron can be frozen! I learnt so much more in this workshop and its an absolute bargain at the price. I hope to attempt some more Macaron at home this weekend now I feel more confident, playing around with new colours and flavours. Then back to Brighton in a couple of weeks for a Cupcake Baking and Decorating Workshop! Angel Food Bakery is a gem of a find.